Dry to normal skin with first signs of aging or as anti-aging prevention. The velvety cream smooths the epidermis and tackles signs of aging by preventing premature development of wrinkles and reducing first signs of passing time. 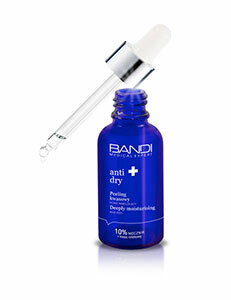 It reduces expression and fine lines resulting from dryness. It also moisturises and adds elasticity to the epidermis. The unique Neuropeptide RC has a relaxing effect on excessive contraction of the skin. It prevents thermal and mechanical stress and relieves irritating external factors the skin is exposed to on a daily basis. Microcollagen, vitamin C and rutin have anti-aging properties, prevent hyaluronic acid from premature degradation, improve moisturisation and boost the physiological processes in the skin dependent on it. Avocado oil is a valuable source of vitamins and reduces unpleasant tenseness of the skin related to excessive loss of moisture. CONTRAINDICATIONS: Hypersensitivity to any ingredient of the formula. Apply in the morning and evening to the cleansed skin of the face avoiding the eye area. For best results apply together with other products from the line.